Wood planks can be very beautiful in your home but they are slightly less durable so if you want to create that wood effect at home, we recommend using faux wood tiles instead. These tiles made out of porcelain and wood are longer lasting but you will still get the same gorgeous effect as well. So get ready to read on about these faux wood tiles that’ll make your home look good. Using faux wood tiles in your bathroom can make it look really rustic and if you use three colours of wood grain, it makes it look more interesting. The porcelain tiles are laid horizontally, which makes the bathroom look more spacious. Grey is a very versatile colour that goes with almost anything and if you’re looking for something more masculine, it works well with the decor too. These porcelain tiles look like they are roughed up but when you step on them, you’ll find that they are actually smooth which is good for your feet. This Zebrano wood effect is a very popular pattern if you are using actual wood but who says you can’t mimic the same look with some faux wood tiles? Used in a herringbone pattern that showcases the pattern perfectly, you will have one of the most stylish living rooms ever. Many people like to put wood tiles in their bedroom as it feels warmer and looks more welcoming but as it doesn’t last long, they will choose faux wood tiles instead. The rich colour of these exotic tiles can be easily preserved and won’t fade even if you expose them to the sun. Your faux wood tiles don’t have to be all boring old wood grain but you can consider quirky patterns like these that will really jazz up the home. Besides, placing them on the wall to create a feature wall will help to highlight their fabulousness. 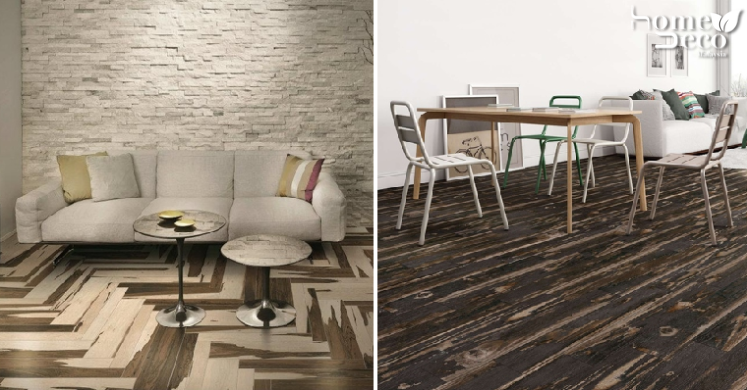 Go for a vintage look with these faux wood tiles that are made to emulate an aged, burnt look that really makes an impact. Pair them with white walls to let the uniqueness of these tiles stand out.